Pérdida inadvertida de un alambre-guía durante canalización de una vía venosa central. Carmen María Muñoz Corchuelo MIR Anestesiología y Reanimación. Hospital Torrecárdenas de Almería. Félix Gallo Pineda Hospital Torrecárdenas Almería. Manuel Cortiñas Sáenz Hospital Torrecárdenas de Almería. Central venous catheterisation (CVC) must be must be conducted by professionals who have appropriate knowledge and/or monitored if they´ re not skilled enough, according with strict guidelines in order to prevent incidents. The incidence of complications is up to 15%, some of them potentially fatal; these may be difficult to avoid, while others are due to human failure and therefore amenable to intervention and completely avoidables. 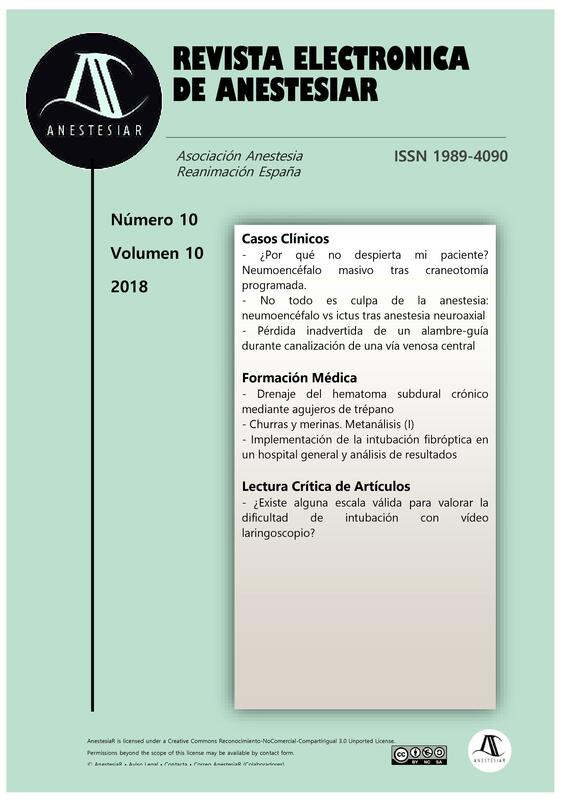 A case report of unoticed canalisation of a central line losing the guidewire is presented; discovered by accident in an image test due to torpid postoperatory evolution, as well as the proposal of a checklist to its prevention. (1) Seldinger SI. Catheter replacement of the needle in percutaneous arteriography - a new technique. Acta Radiol 1953; 39:368-376. (2) Higgs ZC, Macafee DA, Braithwaite BD, Maxwell-Armstrong CA. The Seldinger technique: 50 years on. Lancet 2005; 366 (9494): 1407-1409. (3) Hernández MA, Álvarez C, Pérez MA. Complicaciones de la canalización de una vía venosa central. Rev Clin Esp 2006; 206(1):50-53. (4) CDC Guidelines for the Prevention of Intravascular Catheter-Related Infections, 2011 http://stacks.cdc.gov/view/cdc/5916/ (Accessed on February 06, 2014). (7) Pokharel K, Biswas BK, Tripathi M, Subedi A. Missed Central Venous Guide Wires: A Systematic Analysis of Published Case Reports. Crit Care Med 2015; 43(8):1745-1756. (8) Gordon PC, Linton DM. The missing wire - a complication of central venous catheterization. Anaesth Intensive Care 1992; 20:77–79. (9) Larizgoitia I, Bouesseau MC, Kelley E: WHO efforts to promote reporting of adverse events and global learning. J Public Health Res 2013; 1;2(3):e29. (11) Brass P, Hellmich M, Kolodziej L, Schick G, Smith AF. Ultrasound guidance versus anatomical landmarks for subclavian or femoral vein catheterization. Cochrane Database of Systematic Reviews 2015, Issue 1. Art. No. : CD011447. (12) Bedel J, Vallée F, Mari A, et al. Guidewire localization by transthoracic echocardiography during central venous catheter insertion: a periprocedural method to evaluate catheter placement. Intensive Care Med 2013; 39:1932 - 1937.